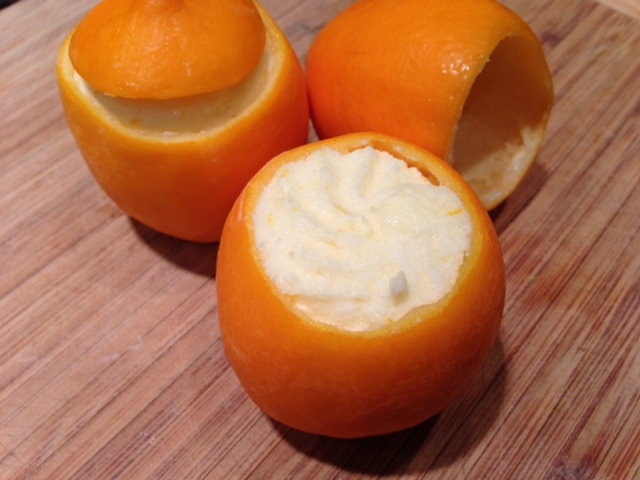 These days however I am more tempted by citrus desserts and citrus mousse. 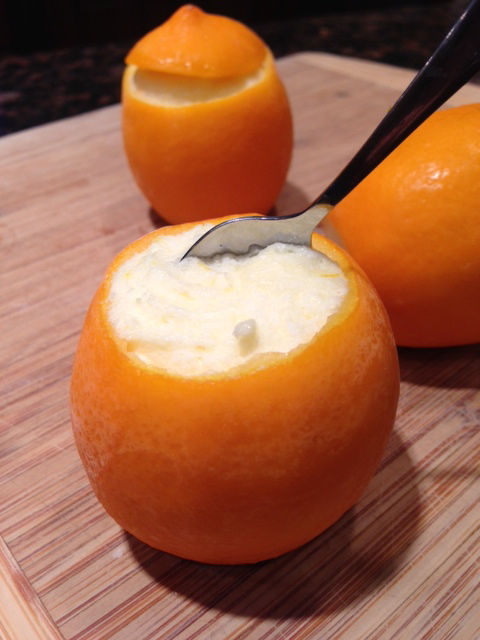 When I saw this recipe on the net last week, it made me think of one of my mom’s favorite: Citron Glace so I had to try it. I made a few adjustments. The recipe was inspired from the Martha Stewart’s website. 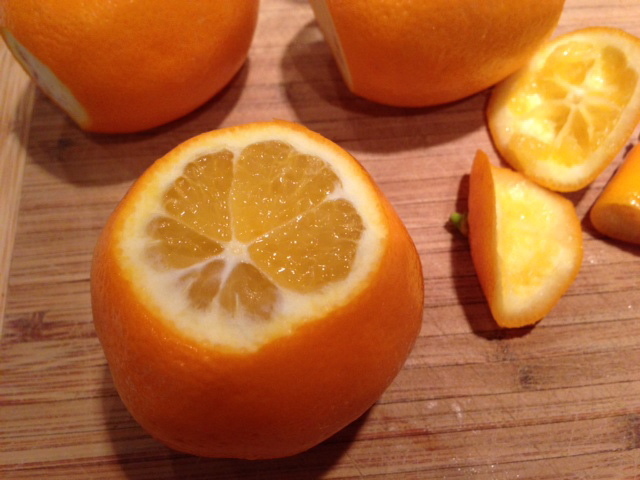 Using a very sharp knife, trim the tip end of each lemon so that they can sit straight. 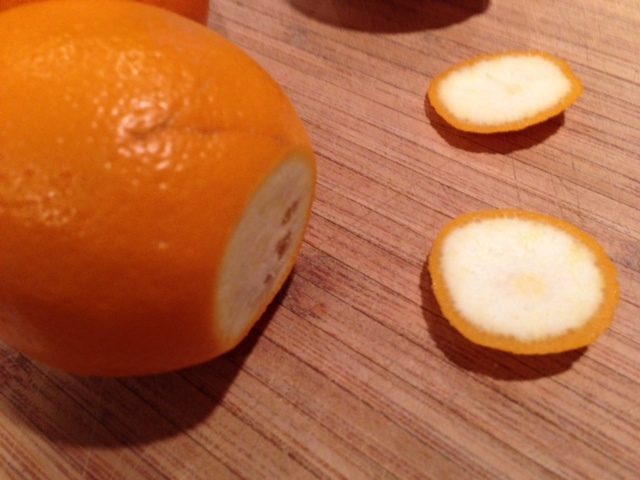 Cut the top of the lemon about 1/4 of an inch from the top. Repeat those steps with all 3 lemons. 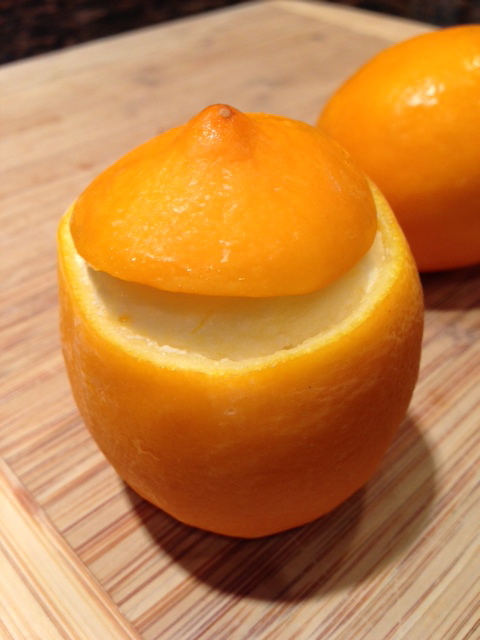 With a spoon, carefully dig into the lemon and scoop the flesh out but being careful not to tear the lemon. 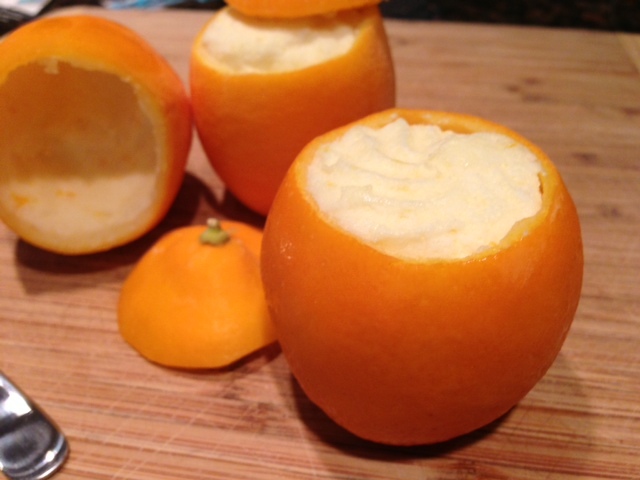 Wrap the lemons in plastic wrap and refrigerate them so they will not dry out. 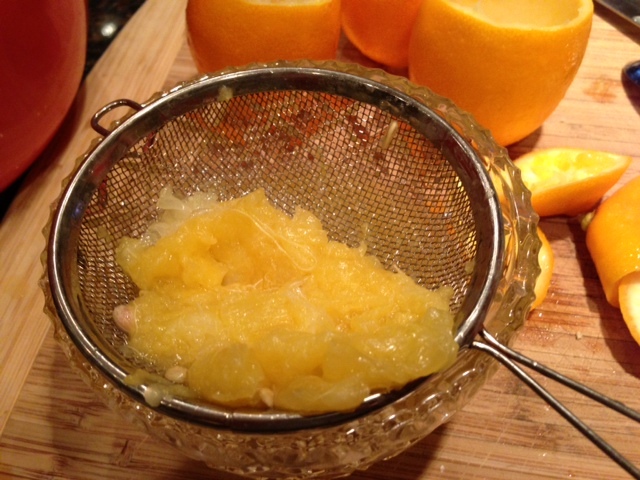 PLace the flesh into a container and squeeze the juice out of it by squeezing the flesh through a a fine sieve. 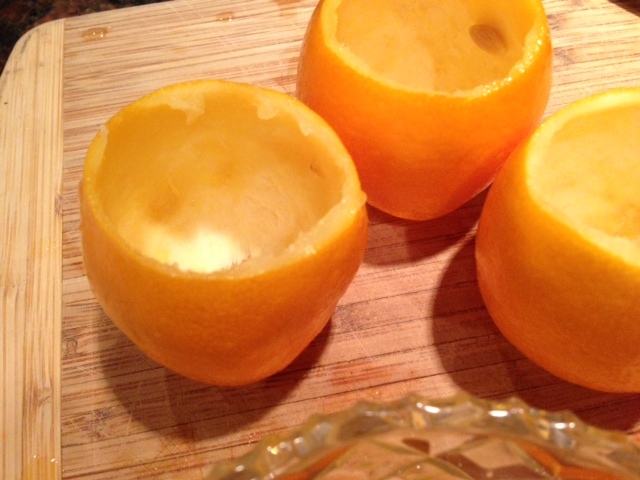 Keep only 1/4 cup of the juice for this dessert, and refrigerate the rest for some other usage. 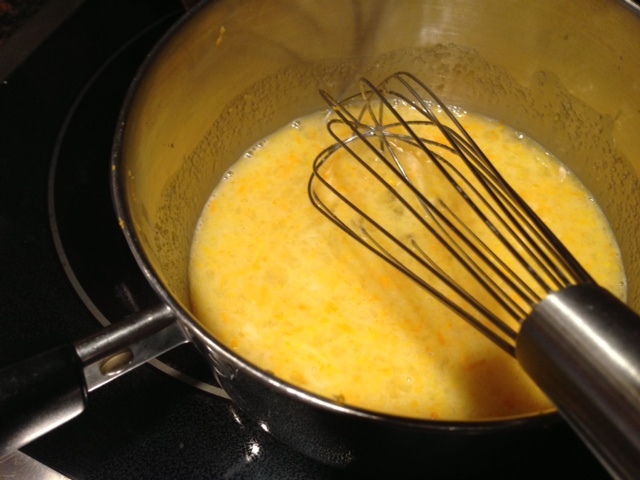 Place the 1/4 cup of lemon juice, the egg yolk and the sugar into a small saucepan and cook until the mixture thickens. Set aside. When the mixture is thick, let it cool completely, then add the butter and mix. Stir in the zest. Cover the mixture with a plastic wrap and seal it well so that a ” skin” will not form. PLace the heavy cream in a mixer and whip the cream until it forms hard peaks. Remove the whipped cream from the mixer and refrigerate. Clean the mixer, add the egg and beat the egg whites with 1 pinch of salt and 1 tbsp of sugar to form glossy peaks. 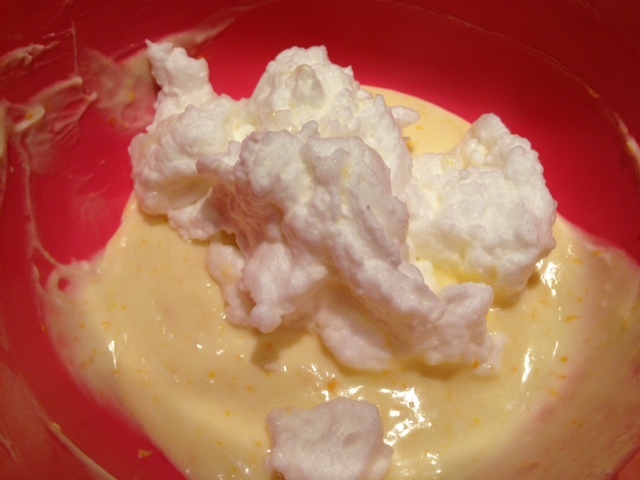 Remove the lemon curd and the whipped cream from the fridge and fold the whipped cream slowly into the curd. Fold the egg whites into this mixture. 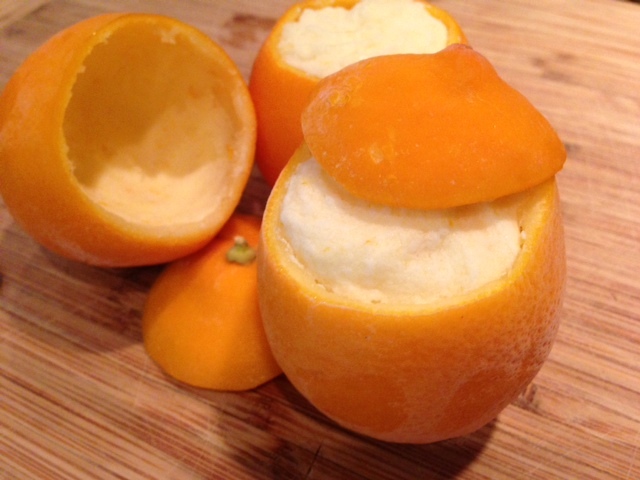 Fill a pastry bag with this mixture, and fill the lemon shells with this mixture. Refrigerate for at least 1 hour. I personnally froze mine.